Miller Homes' apprentices Josh Turner, Owen Rees, Adam Corbett and Luke Hodgson. An apprentice is looking to build on the new skills he is learning. Adam Corbett, from Killingworth, is one of four apprentices taken on by Miller Homes to work on its developments around the North East. The 16-year-old will be an apprentice joiner working on the Heritage Green development in Backworth. Adam will combine practical work and training with college studies, resulting in a recognised qualification and potential full time job offer. Patrick Arkle, operations director at Miller Homes North East, said: “Being able to recruit is always a great position to be in and I’m pleased to have welcomed four new apprentices. 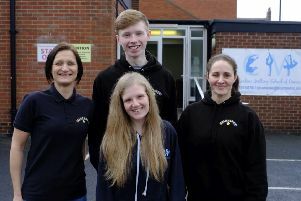 “Our new apprentices have joined the business at an exciting time as we are actively working to grow our presence in the region, with four development launches coming soon as well as more to follow over the next 12 months and beyond.